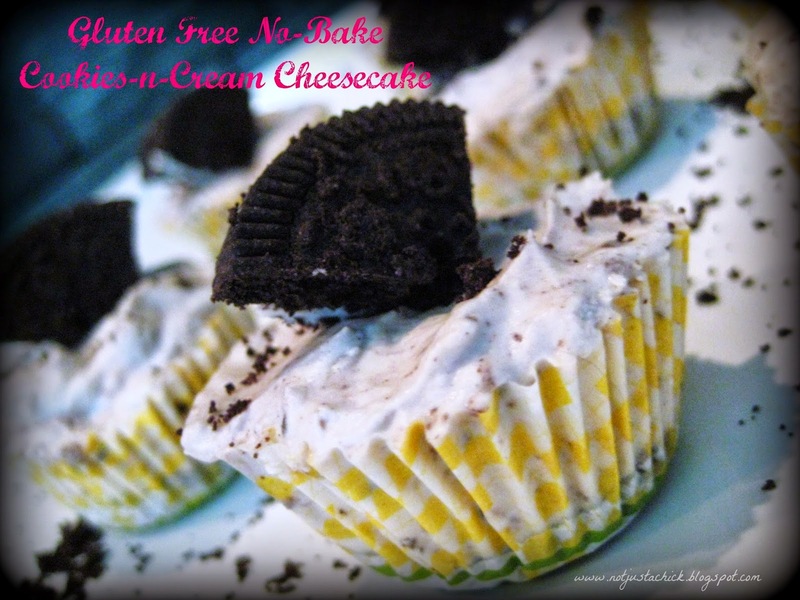 Not Just A Chick: Gluten-Free NO BAKE Cookies-n-Cream Cheesecake,,,it's been how long!?! Gluten-Free NO BAKE Cookies-n-Cream Cheesecake,,,it's been how long!?! OK OK... sooooo I've been a slacker. I take full blame... That being said, a lot has happened over the last few months in this thing called "My Life". There's been UPS... downs (lots!)... buuuuuttttt I appear to be grasping onto that ladder...and seemly headed back UP. whew. 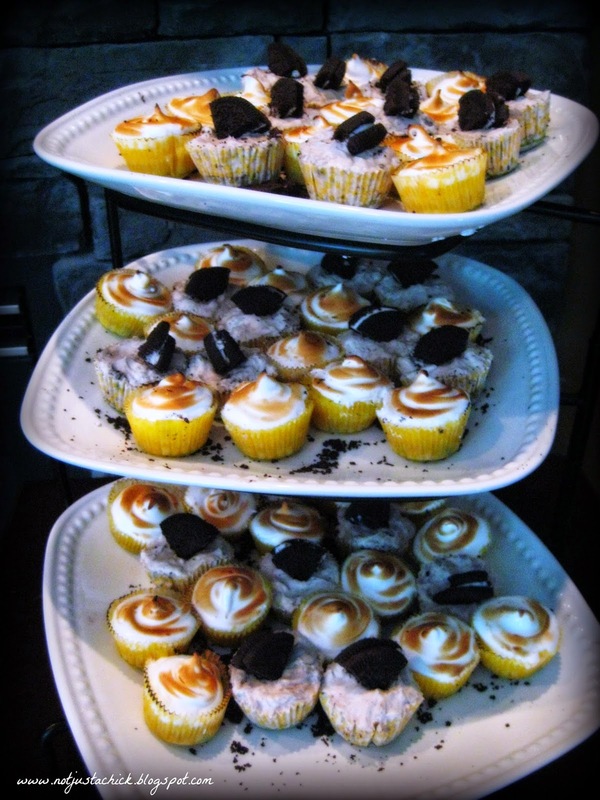 I can add another "activity" (or 2) to my "list" of hobbies... and have recently achieved something I never thought possible... YUP... this "Chick" can "Run".... and THAT my friends, deserves a lil' treat..... Gluten-Free NO BAKE Cookies-n-Cream Cheesecake -Bite Size! Over the past 6 or so months, I've gotten close with an amazing group of women. It took the encouragement of one in particular that words cannot describe how grateful I am that she believed in me, took the time to "dummy" it down, push, and then run right beside me as I finished my first ever 10km race. Love to hate... Hate to Love these awesome ladies! NOPE... I wasn't the fastest (heck, not even close - TURTLE TURTLE), however was determined. I was able to run, the entire race - non-stop, with my super amazing friend right beside me, pacing me, and making sure I didn't give up. I'm down a few "sizes" in the looks department, and for the first time... in a long time... am unafraid to wake up and look in the mirror. I actually CRAVE exercise now. weird. who knew that could happen?! Anyways... mushy stuff aside... I am truly blessed to have this group in my life! #YOLO. BUUUUTTTT now... back to the YUMMY stuff.... hey, I've earned it! Have you?! - Using the Whisk attachment with your mixer, whip the Whipping Cream on high speed until stiff peaks form. - Scrap with a spatula into a medium sized bowl, set aside. - Place cream cheese, vanilla, sugar in the mixer bowl. Using paddle attachment, mix on high until well blended and smooth. - Spoon mixture onto top of crumb base. Place in refrigerator for at least an hour. Feel free to lick spoons.. bowls.. fingers..... while you are waiting for them to set in the fridge! Being that I was headed off to a dinner with GF (Gluten Free) friends.... I couldn't just stop at one sweet treat! ... heck, it had been awhile.. I was on a roll.... here's a SNEAK PEAK... at the next upcoming post.... Gluten Free Lemon Meringue Bites...... See ya'll soon!